As far as third party publishers go there aren't much bigger than Ubisoft, often criticized for formulaic games, this big publisher could make some big changes or fall back into their rut. Also, we can easily anticipate that Mario X Rabbids game, since it was leaked to kingdom come. Here's what they had to show at E3. Starting off the show, in an insane surprise we saw Mario creator Shigeru Miyamoto come to the stage with Ubisoft CEO Yves Guillemot to show off the Nintendo Switch's new Ubisoft exclusive which is officially titled Mario + Rabbids Kingdom Battle. This Mario mash-up is a turn-based RPG in the vein of something similar to XCOM. Hiding behind cover, using tactical movement on a battlefield, and blasting enemies doesn't typically feel very Mario, or even very Rabbids-like for that matter. Here's the new trailer and look forward to the game's release on August 29, 2017 for the Nintendo Switch. At yesterday's Xbox Press Conference we saw an official announcement for Assassin's Creed Origins alongside some new gameplay of the recently announced game. At Ubisoft's show, they returned to the game with a new trailer and teased some gameplay to follow after the conference. A reminder that the game releases on October 27, 2017. With a focus on multiple vehicles, a central character, and a bigger world, The Crew 2 just seems like a bigger, better version of the original game. Similar to games like Fifa, NBA Live, and Madden at EA's E3 show this new game seems like it may have a story mode following a stunt driver, or I'm totally wrong and that character is just meant to represent the player. You can decide with this new CG trailer. Following that CG trailer we saw a look at the gorgeous new game in-engine and information about the beta, which can be signed up for at www.thecrewgame.com/beta. No solid release date at the moment aside from an early 2018 window. Transference was teased for a Spring 2018 release date in one of the vaguest ways possible. Aside from Elijah Wood being there and it being a VR project there really isn't too much to take away from this tease. Check it out here and see for yourself. Following the love for Assassin's Creed IV: Black Flag, Ubisoft wanted to capitalize on the game's naval combat but since seeing Assassin's Creed Origins it's clear that they're not taking the Assassin's Creed series in that direction. After a stylish cinematic trailer they showed off some pre-alpha gameplay. After seeing that game in action it's clear how much inspiration Black Flag will have on Skull and Bones, menus, camera, and reticules look identical to the pirate themed Assassin's adventure, which may not be a bad thing. While I personally didn't love the game, many gamers found it to be the best entry in the Assassin's Creed series. The game aims to release by Fall of 2018. The family-friendly dancing game returned to E3 with their typical boistrous stage show. A lengthy dance number ended with an October release window for Just Dance 2018 on every major console. It seems to be just more of the same but it'll be our first chance to play it on the Nintendo Switch. Plugging in a toy directly to your controller will build your ship in Starlink: Battle For Atlas. A space shooter that will release in Fall 2018 for PS4, Xbox One, and Nintendo Switch. The big gimmick seems to be the inclusion of the physical spaceships. Check out the gameplay trailer below. Steep: Road to the Olympics is an upcoming add-on for Steep that takes players to the upcoming Olympic Games. Adding events like Big Air and Races, Road to the Olympics will launch on December 5th, 2017. Here's the new trailer. 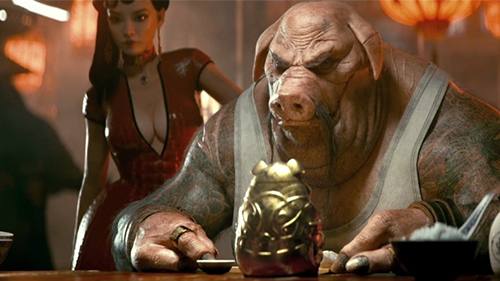 It's been 9 years since the announcement trailer, the original game was played on the Xbox, Game Cube, and PlayStation 2 but we are finally going to be playing Beyond Good and Evil 2, the upcoming sequel will actually take place before the original game. Michel Ancel, creator of Beyond Good and Evil and Rayman, came to the stage in tears to show off the new game. Joining the Space Monkey Progam at BGEGame.com will get you in on some early access about the new game, though the team at Ubisoft was vague about what that possibly could have meant. A spectacular way to close out the show. This is my favorite conference so far, but what about you? How did you enjoy Ubisoft's show? Comment below!